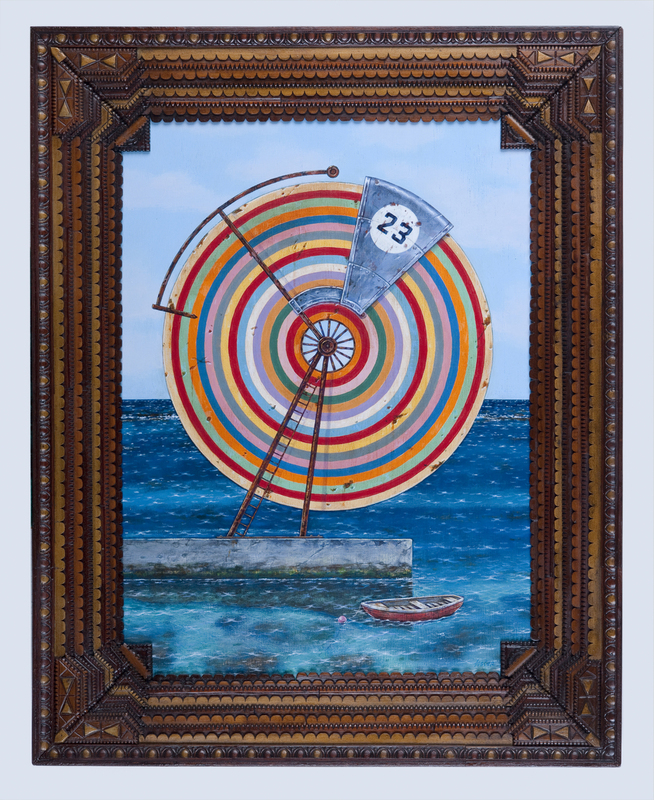 This painting, by Contemporary Bermuda-based Artist Graham Foster, is complete with an antique wooden Tramp Art Frame (American, ca. 1920's), collectible in its own right. According to the Artist, "the first wheel (painting) appeared in 2003, and had 8 carved wooden spokes, possibly a Dharma Wheel, with the 8 spokes representing the eight fold path to enlightenment... the wheel is a sculptural or physical manifestation of the spark within, or the soul. The slings and arrows of life add to the deteriorating condition of the wheel - some being more damaged than others." Graham Foster (1970– ) is a Bermudian painter and sculptor whose native land, and its history, have played a vital role in his work. His paintings generally trend in one of two directions: the first inspired by Bermuda’s fish, flora, fauna, and people, captured in a uniquely surreal style; the other is looser and more expressionistic, influenced by dreams and the subconscious mind. 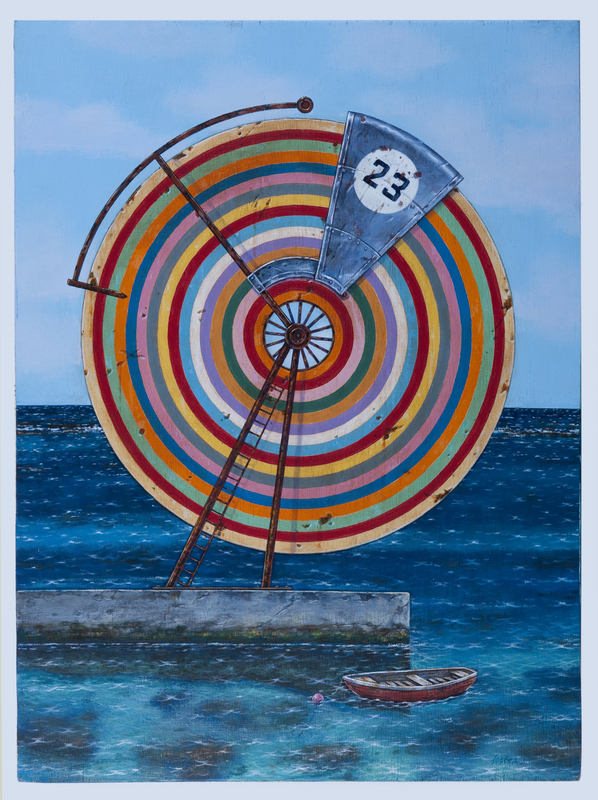 Featuring bold colors and considerable detail, many of his Bermuda-themed paintings are transformed into high-quality lithographic prints, personally signed and titled. Foster, the son of Dr. Elizabeth Foster and Alec Foster, has been a professional artist since 1995. He received his education at the Bermuda College and at the Museum School of Fine Arts in Boston. At present he is best known for his larger-than-life mural, The Hall of History, located in the Commissioner’s House at the National Museum of Bermuda in Dockyard. Begun in 2005, the two-story, one thousand square foot acrylic-on-wood (marine ply) interior mural took approximately 7000 hours (over three years) to complete, and depicts five centuries of Bermudian history, interweaving significant events such as the establishment of the island’s first human settlement (following the wreck of the ship the Sea Venture in 1609) with portrayals of the island’s flora, fauna, traditions, transport, religion and culture. One of the prominent transport features is the Bermuda Railway Train that no longer exists today. In order to create the mural, Foster researched deep into Bermuda’s history and collected volumes of information from many sources, including the Internet. Not long before work was initiated (about half of the work was executed on site, the other half in the artist’s studio), the venue was in a dilapidated state, but was admirably restored by the critical intervention of Dr. Ed Harris and the staff of what was then called the Bermuda Maritime Museum. On November 25th, 2009, the mural was officially opened by Her Majesty the Queen, to whom the artist gifted a painting, The Wreck of the Sea Venture. Recent public projects include the Washington Mall’s Maritime tree grates (2010), the Yoko Ono-endorsed John Lennon tribute sculpture, Double Fantasy (2011), situated outside the Masterworks Museum of Art, and a mural located at the Bermuda College library which commemorates the works of Brian Burland, considered by many to be Bermuda’s greatest author. His solo exhibitions include showcases at the The Masterworks Foundation and the Ace Gallery, and his work has been displayed at several Bermuda National Gallery Biennials. In 2009 he won a $10,000 Charman Grand Prize for his painting The Mechanics of Extinction. Collections that possess Foster’s work include Bausch and Lombe New York, The Bermuda Anglican Cathedral, The Bank of Bermuda, The Bank of Butterfield, Ace Insurance, LOM, Allianz Re, The Bermuda Commercial Bank and The Masterworks Foundation.